Finally, Tatsuya showcases his infamous Material Burst spell. It definitely was quite the destructive spell…and Miyuki really expects us to believe that Tatsuya “sacrifices” in other magic areas in order to cast his Regrowth spell? What is even the mechanism of this spell? He radiates energy from a single point annihilating anything within a certain radius? Anyway, as expected, this week’s episode was a complete and utter stomp by Tatsuya. When you have someone who can revive allies and also instantly obliterate enemies, how do you not just want to take over the world? It’s too bad…this show’s premise wasn’t terrible. It just got way too ridiculous as time moved on. This ending does leave the story open to continuation, with its “this is just the beginning” message, but I really don’t know how I feel about another season. I really haven’t been paying all that much attention in these last few episodes to what’s happening. Well, I don’t really know what to say this week. It looked, for the most part, like the episode was a complete and utter destruction of the enemy. The only part that looked the slightest bit dicey was the skirmish at the very end of the episode, but the God Tatsuya can apparently cast his healing spell on others as well, so he pretty much invalidates any remnants of the enemy’s surprise attack. Mahouka Koukou no Rettousei Episode 24: Full power? Author marthaurionPosted on September 16, 2014 Categories Mahouka Koukou no RettouseiTags magic tech4 Comments on Mahouka Koukou no Rettousei Episode 24: Full power? It’s finally time for the thesis competition presentations…although the presentation from Tatsuya’s group wasn’t particularly interesting. Also, it looks like Masaki is back…time for him to serve as an ally. Most of this week’s episode seemed to be a lot of shoring up of defenses in preparation for an attack…which ends up happening at the end of the episode. Next week, I assume will be a fight against the Chinese group. There was talk this week of a mobile suit…wonder if that will be interesting. Presumably, the next episode will be a lot of showing off for all of the characters that we’ve seen training up to now, as well as Masaki…then Tatsuya cleans everything else up. That’s the usual MO, right? That was…kind of a weird moment at the end of the episode. Anyway, I’m assuming the student they captured this week was the mystery student from the end of last week’s episode. 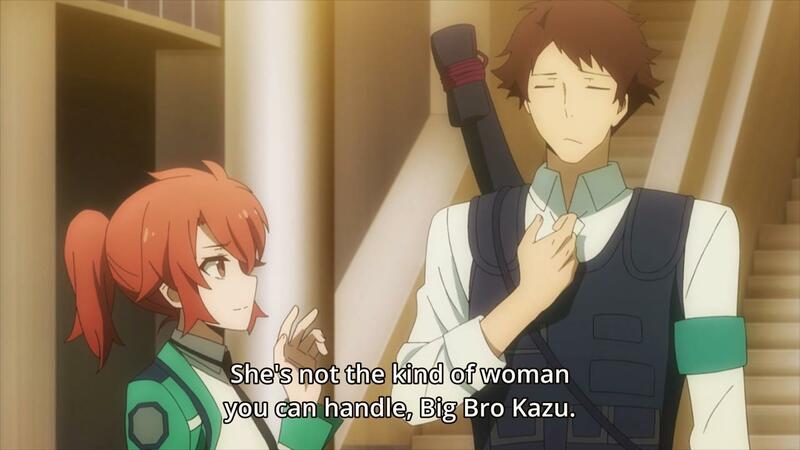 Tatsuya dealt with him pretty easily. It looks like the other spy student will still be relevant, though. Apparently, she’s being charmed…and very possibly lied to about the whole ordeal with her sister. Is the Thesis Competition supposed to be happening soon? I guess it’s not that important in comparison to the lies and betrayal happening everywhere else. Still have a few more episodes left in this arc before the season ends…this arc doesn’t seem all too different from the last arc so far, so hopefully it will try to do something interesting. Mahouka Koukou no Rettousei Episode 21: The enemy is here! It looks like this week’s episode was mostly training and relationship-building for Leo and Mikihiko. It was essentially what I would call cheap fanservice to get those relationships on the surface. We also find out that the spy student in First High is apparently related to the engineer from the previous arc that was involved in the Mirage Bat accident. I don’t know if there was any way I could have predicted that…it seems like such a lousy reason for revenge. Presumably, the last scene in the episode indicates that one of the members of the enemy group has disguised himself as a student and infiltrated the school. Does that mean that the action starts up next week? I assume that the enemy will be disrupting the demo for the Thesis Competition since it looks like it’s almost done. 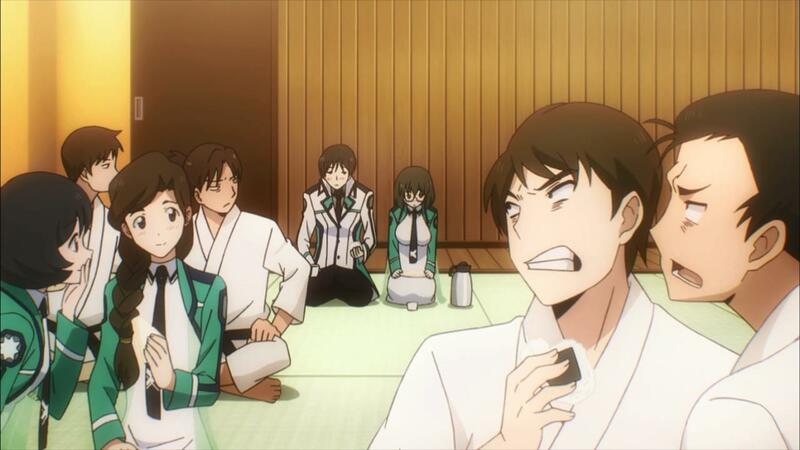 Author marthaurionPosted on August 26, 2014 Categories Mahouka Koukou no RettouseiTags magic tech2 Comments on Mahouka Koukou no Rettousei Episode 21: The enemy is here! A lot of the conversation this week seemed to suggest that the Thesis Competition was coming pretty close…or at the very least, there wasn’t all that much left to be done for Tatsuya and his team. 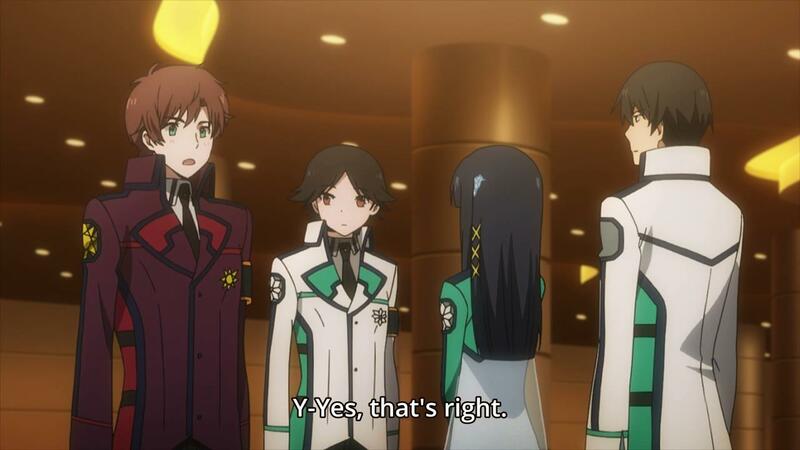 Just what exactly has Tatsuya been able to accomplish in this short time? He’s not going to break another barrier of magic research effortlessly, right? 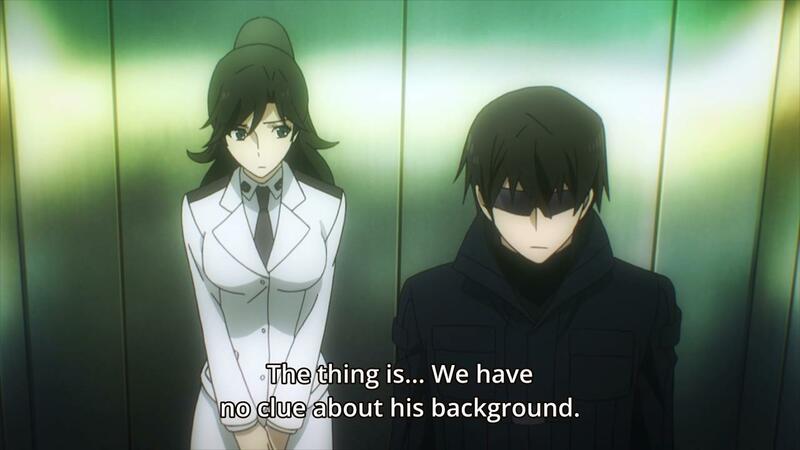 Mahouka Koukou no Rettousei Episode 19: So now he can survive a sniper bullet through the chest too? Oh, so Tatsuya is going to be making a Philosopher’s Stone this time? Seems pretty standard by this point. It looks like the main goal for this arc is the creation of magic weapons, so that regular people can use magic. It sounds like a perfect precursor to a revolt against the magicians, right? But I’m assuming there’s not enough time left in this series for that. Author marthaurionPosted on August 12, 2014 Categories Mahouka Koukou no RettouseiTags magic tech4 Comments on Mahouka Koukou no Rettousei Episode 19: So now he can survive a sniper bullet through the chest too? Another arc comes to a close? This was a pretty boring wrap-up episode. We got a bit of a taste of how powerful Tatsuya really is as he wipes out most of the No Head Dragons from a distance, but all of it happens fairly quickly. I’m not sure I fully understand, though…he really gains his power back when his emotions regarding Miyuki are stirred? That seems like a fairly easy thing to exploit if I were Tatsuya. It looks like Tatsuya’s performance in the Nine Schools Competition has earned him some attention from the Ten Master Clans. Are they going to be the final enemy in this series? Theoretically, we’re coming up into the final arc. Are we heading towards a resolution of some sort or will this arc end in more questions? Mahouka Koukou no Rettousei Episode 17: Time for battle? Tatsuya really let Miyuki use his Flying Magic? He really is the military’s worst-kept secret…I’m surprised no one realized he was Silver. Anyway, it looks like the No Head Dragons have escalated from “winning bets” to “invalidating the tournament so there are no losses”. Are there any more events in the tournament? It feels like their should be…if the events are all over, then presumably First High won and there would be little point in further action from the No Head Dragons (other than throwing a tantrum from losing their bets). I suppose the other possibility is that they really don’t intend to do anything more, but Tatsuya will hunt them down and exterminate them like he did in the first arc. He should be getting the location of their base pretty soon, right? Either way, this arc should be coming to a close within the next two episodes. Author marthaurionPosted on July 29, 2014 Categories Mahouka Koukou no RettouseiTags magic tech8 Comments on Mahouka Koukou no Rettousei Episode 17: Time for battle?